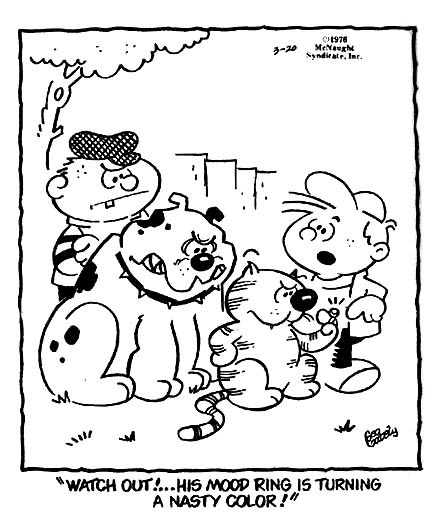 George Gately created Heathcliff in 1973, after nearly 15 years of cartooning. The character became popular enough to warrant two animated cartoon shows (in 1980 and 1984) and a respectable 56-issue run of comic books from Marvel in the late 1980s. Gately eventually died in 2001 at age 73, but his nephew Peter Gallagher had already taken over the strip in 1998. 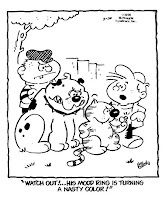 As a kid, I rather liked Heathcliff. He always carried himself with a high degree of confidence and didn't concern himself with what anyone else thought. True, he tended to be very self-centered and ego-centric, but a child's world-view isn't all that different really. I stopped reading the strip when I left for college, primarily because I didn't buy daily newspapers like my parents did. 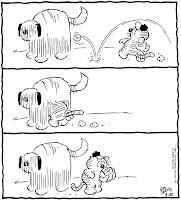 I only started reading again a few years ago when I began looking at online comics in earnest, and saw that most syndicated newspaper strips were also available. It's certainly not a strip that's high on my list of funniest comics these days. 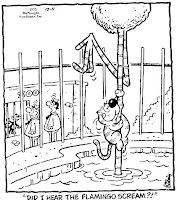 Like many newspaper strips, it feels a bit tired with a lot of recycled ideas. The backgrounds look very flat; there's little or no sense of depth shown. Lines just sort of fade out and don't connect with one another, so characters look like they're floating legless sometimes. There's also very little change in line weights; there's a thin line and a slightly thicker line, but there's no variation in the strokes. I was surprised to see that Gately didn't alter his line weights much either, and he also left backgrounds somewhat half-drawn and disconnected. In fact, in the examples I found, he uses fewer spotted blacks as well. But Gately's work still looks better! I've been staring at these a while now, and I think the main difference is in the compositions themselves. In Gallagher's strips, all of the individual elements have a similar visual weight to them. Despite the greater use of spotted blacks, the layouts present all of the characters on the same visual plane, taking up about the same amount of space. 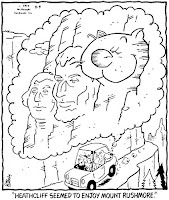 That first strip is a prime example -- the Capitol, the stork and Iggy/Heathcliff all seem to be of equal importance and there's nothing to really give a sense of perspective or scale. The Capitol could be quite a ways off, but we don't see any other figures for reference. 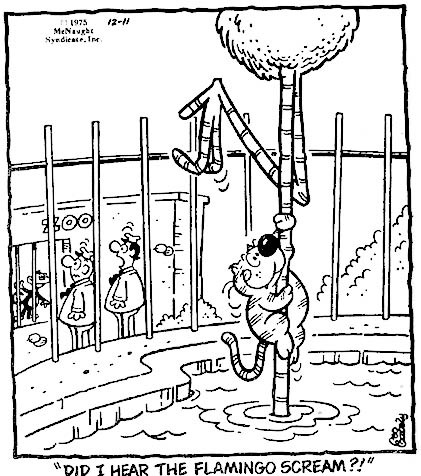 Compare that to Gately's zoo cartoon above, in which the flamingo is so close in the foreground that it stretches right out of the panel and the zookeepers in the background are shown further away in perspective, relative to Heathcliff. Notice, too, that Gallagher always keeps the same type of medium shot with his layout. 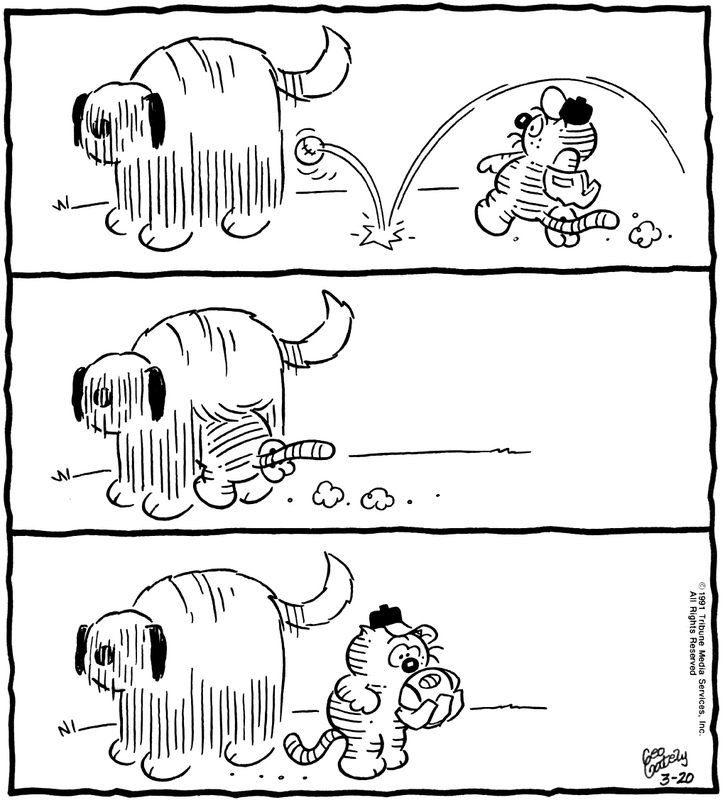 All the figures are fully visible; Heathcliff is always pretty much the same size in every strip. Gately, by contrast, shows a wider variety of shots from strip to strip. Even all the medium shots are slightly different in size/ratio. What's interesting here is that we're looking at a now-legacy strip in which the successor actually does a good job replicating the tone of the original, as well as copying the look of all the figures very well. But there's still a noticeable difference between Gallagher and Gately, with Gately seemingly the better all-around artist as evidenced by his superior compositions. Interesting to compare. 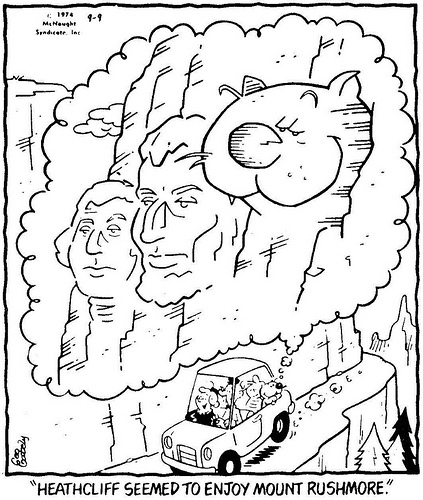 I don't know if it's just the ones you picked but Gallagher also seems to try to avoid drawing Heathcliff's face or the front of him, and always keeps him small.